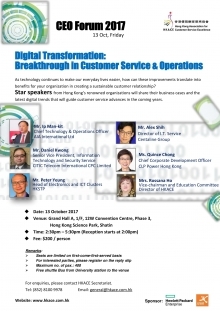 HKACE is going to hold CEO Forum 2017 on 13 October 2017 at Hong Kong Science Park. 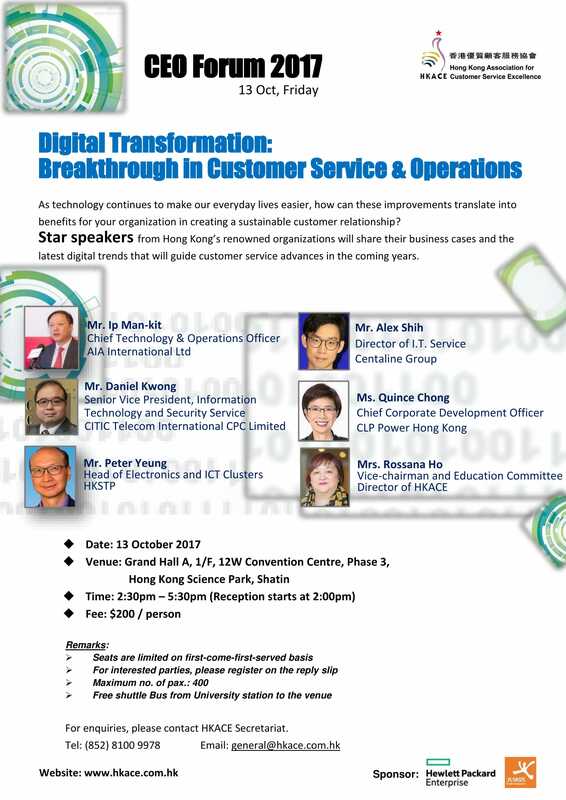 The theme of forum will be Digital Transformation: Breakthrough in Customer Service & Operations. In the forum, we have invited Chief Technology & Operations Officer of AIA International Limited, Mr Ip Man-kit; Director of I.T. Service of Centaline Group, Mr Alex Shih; Senior Vice President, Information Technology and Security Service of CITIC Telecom International CPC Limited, Mr Daniel Kwong and Chief Corporate Development Officer of CLP Power Hong Kong, Ms Quince Chong. Mr Peter Yeung from Head of Electonics and ICT Clusters in HKSTP would also be the key note speaker.